How Long Should You Keep Financial Documents? The primary reason we must keep at least some of these documents is that they support information provided in our tax returns. This also means that if changes brought about by the new tax bill mean you will no longer itemize your deductions beginning this year, you will need to retain fewer records in the future. The question is, “What records should we keep?” Unfortunately, the answer is you likely need to keep more than you might think. Please note that there is a lot of information here. To help make things easier, there is a summary table listing document types and how long they should be retained near this blog's end. Since we must retain records to support the information reported in our tax returns, it makes sense to use the IRS’ rules as a starting point when deciding what to keep. If you are ever audited by the IRS, you want to be able to provide information the auditor asks about. First, the IRS expects you to keep your tax returns and any supporting documentation for three years after you file your returns. However, it is not that simple. If, for some reason, you understate your reportable income by an amount that is at least 25% of the gross income you did report, then you need to save your records for six years from the filing date. If you fail to even file a return in certain periods, the IRS expects you will retain those records forever. According to this IRS tip sheet, you, you are also supposed to keep your records indefinitely if you file a fraudulent return. This seems a bit ironic. The IRS tells us not to cheat on our taxes, and we agree wholeheartedly with that view. However, if you did cheat, the normal inclination would be to destroy the evidence. Instead, the IRS tells you to hold onto it. It is also important to keep in mind the rules for state tax returns. A general guideline on how long state tax records should be retained can be found here. The bottom line. Keep your tax returns and the related supporting documentation for at least seven years. Take heart. If you are worried about keeping too much paper, the IRS says you can scan paper documents and save them digitally. Credit card statements can also be used to support your deductions, so you can shred or otherwise dispose of many receipts. Evidence for payment of mortgage interest and real estate taxes, which are primarily reported on Form 1098, should also be kept. Special rules for charitable contributions can be found in IRS Publication 526. These rules are particularly relevant for contributions of $250 or more to a single charitable organization. Your bank may be able to provide transaction data years later. However, you should ask before assuming anything. By law, banks are required to keep most records of checking and savings accounts for five years. Some banks will keep records for as long as seven years. If you move your account to another bank, your old bank will still look up the information (you will not be able to as you will no longer have online access). However, you may have to pay a fee. The primary items to keep are those related to your taxes, business expenses, home improvements and mortgage payments. Home improvement records should be retained for as long as you own a home – your cost basis in the last home you own can be impacted by what you paid and what improvements you made to every home you owned. Such records should be retained for seven years after selling your last home. Other receipts should be kept for seven years. If you have a taxable brokerage account, you should keep track of what you paid for a stock, bond, or mutual fund (your tax basis) to calculate gains and losses later. If you reinvest dividends or hold an interest in a master limited partnership entity, your basis will not simply be represented by what you initially paid for the shares. This means you should retain records supporting reinvested dividends as well as copies of any K-1s received from partnership interests. As a general rule, your brokerage firm will keep track of basis for you. New record keeping rules went into effect for most transactions beginning in 2011. If you transfer your account to another institution, the cost basis information for the transferred assets will also be transmitted electronically to your new firm. At the same time, it can help to keep these records in your files as a backup. For example, you could archive all your electronic trading notifications in your email, or scan paper statements or a year-end summary of all transactions and store it on the cloud or an external hard drive to be safe. Your financial advisor should also maintain records of transactions that take place while you are working with them. Remember electronic transaction records only go back so far. As a result, you may need to rely on your own records for supporting your cost basis in investments held for a considerable period. In summary, you should generally keep records supporting your tax basis in an asset held in a taxable account for seven years after it was sold. If you have made nondeductible contributions to your individual retirement accounts, your brokerage firm may not be able to help you substantiate such contributions. Brokerage firms do not typically have access to the relevant IRS document – Form 8606 – which taxpayers use to report such information. In such cases, you will want to maintain those records until you have withdrawn all your nondeductible contributions to the account. You should also hold onto any records of conversions from regular Individual Retirement Accounts (IRAs) to Roth IRAs to substantiate your eligibility to withdraw the money free of taxes years later. If you work with an accountant, they may have copies of such documents as well. You should keep the quarterly statements from your retirement/savings plans until you receive the annual summary. If everything matches up, you should keep the annual summaries until you retire or close the account. You should keep a copy of purchase and sale contracts for any homes you own to support your claim of basis. Similarly, retain home improvement records if you believe the value of your home will increase meaningfully over time, as the tax rules will allow those who file joint returns to exclude up to $500,000 of gains on the sale of their personal residence ($250,000 for individuals). IRS Publication 523 provides further guidance related to the rules for excluding a gain on the sale of your home. The costs of improving your home (not ordinary maintenance and repairs) can increase your tax basis in your home. You should also keep records of expenses incurred in selling and buying the property, such as legal fees and your real estate agent’s commission, as these can also increase your tax basis in the property. You should retain such records for seven years after filing the tax return that includes the sale of your final home. It is a lot easier if you rent property. It is okay to shred rental agreements after you have moved out and the landlord has returned your security deposit. Review your bills annually. In most cases, after the canceled check from a bill is returned, you can shred the bill. But, invoices for big purchases; e.g., jewelry, rugs, appliances, antiques, cars, collectibles, furniture, computers, etc. should be kept in an insurance file (paper or electronic) for proof of value in the event of loss or damage. In the case of credit card receipts and statements, you should keep your original receipts until you get your monthly statement. You can shred the receipts if the two match up. Keep the statements for seven years if tax-related expenses are documented. When you receive your annual W-2 form from your employer, you should match it to the information on your pay stubs. If it does, you can shred the stubs. If it does not, you should request a corrected from, known as a W-2c. Estate planning documents can give rise to issues, so it is important to retain originals of any will, trust, durable powers of attorney for both medical or financial affairs or related documents, as well as beneficiary designations from insurance policies or investment accounts. If you are married and have a pre- or post-nuptial agreement, this should be kept as well. If you received an inheritance or gift, you will need to document its value as well. As a result, you should keep the related IRS forms. As a result, you should keep the related IRS forms – 706, 709, and 8971 – forever. While it does not relate directly to document retention, you should also keep a secure file with account numbers, user names, and passwords for any online accounts. This will help family members immeasurably when they need to access accounts after you are gone. In the event of your sudden death or incapacity, it helps considerably if your named agents for medical and financial affairs are fully informed of the details of your personal data. This will make it easier for them to act on your behalf. its explanation of benefits forms as well. You should hold onto copies of all major insurance policies. You should also develop a home inventory of things you will want to replace if they are damaged or stolen. Such records are best kept in a safe deposit box. Taking pictures of such items can also make any insurance claims a lot easier to process. Agreements for all major loans, such as student, auto, and mortgage should be retained along with any letters confirming payoff. Records of child support, alimony and other records should be maintained forever, too, as well as the divorce documentation, particularly if the relationship is unfriendly. You should also retain birth certificates and Social Security cards. Similarly, if you served in the military, discharge papers may come in handy. Warranties should be retained for as long as the warranty is in effect. Manuals should be kept for as long as you still own the item. For each vehicle you own, keep the title. If you are meticulous, you can retain the repair and maintenance records as well. Adopt a filing system and stick with it. Be careful about falling back into bad habits or delay filing your documents so long that the idea of how long it will take to get caught up keeps you from putting things where they belong. At the beginning of each calendar year, it can help to establish an accordion file (or, for your computer, its equivalent for scanned documents). Label a divider to cover each bank or investment account as well as income or expense type. This file can be helpful in matching receipts to credit card and bank statements as well as when preparing your taxes. At the end of each year, you should purge this file, keeping items you need. There is no need to keep documents longer than necessary. If the document contains personal information, you should shred what you no longer need. If you ball behind. Do not despair. Schedule time to get things back in order when you have more free time. Tackle the problem a little bit at a time. The important thing is to keep your goals achievable, so that you can get back to being organized. 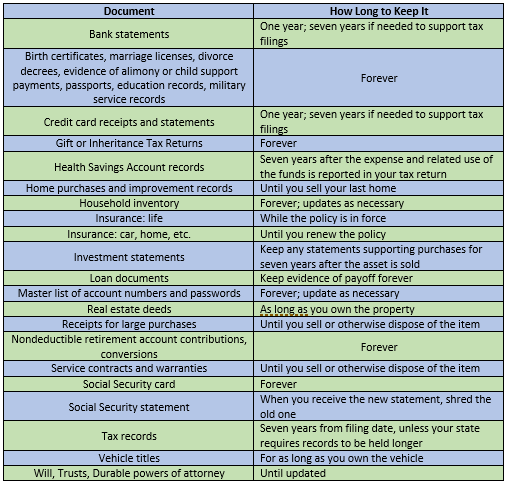 Below is a summary table showing how long you should keep specific documents. Maintaining your records can be helpful if you want to create or update your financial plan. They can help you and your financial advisor identify what is important to you as well as what your assets are and what your future income and spending requirements might be. If you would like to talk to us about creating a financial plan, please fill out our contact form, and we will be in touch. Please note that we post information about articles we think can help you make better decisions about money on Twitter.